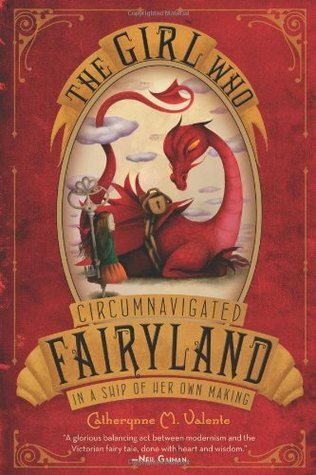 The Girl Who Circumnavigated Fairyland in a Ship of Her Own Making by Catherynne M. Valente has been on my reading list for over a year possibly two. So, I thought I shouldn’t end 2014 without reading it. I wanted to start out the year on a positive note, so I pushed back on posting this first in 2015. Twelve-year-old September lives in Omaha, until one day, September is met at her kitchen window by a Green Wind (taking the form of a gentleman in a green jacket). The Green Wind invites her on an adventure, implying that her help is needed in Fairyland. An omniscient narrator who charmingly describes the events of September’s adventure in Fairyland tells a story that is full of oddments that are just adorable. Yet, somehow there was a disconnect. The writing was beautiful, sentence after beautiful sentence. Yet, for whatever reason it didn’t move me. It didn’t grab me. I really did not care what happened to September. It wasn’t until the last chapter or two where things started to come together, at which point, Valente pretty much lost me as a reader. The age range for the series is 10 to 14, and I’m not sure if they would want to continue reading it to the end. While the last few sentences had mind blowing implications for the rest of the series, I’m not sure I will read it. This entry was posted in Fantasy, Middle Grade and tagged Catherynne M. Valente, fairy tale, fantasy, middle grade, Middle grade reader, The Girl Who Circumnavigated Fairyland in a Ship of Her Own Making. Bookmark the permalink.